If you’ve ever wondered why cake batter Curdles ( splits ) when eggs are added, if it can be rectified or even if it really matters then continue reading. 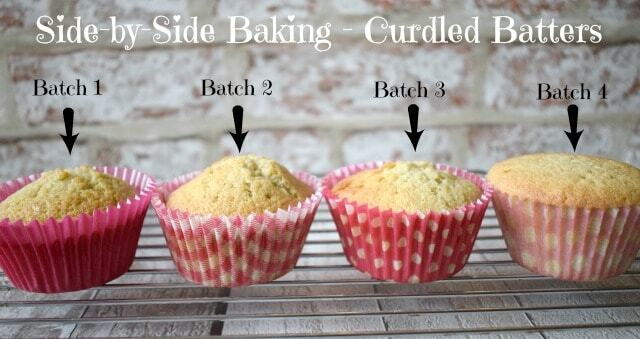 Here I carry out a 4 way comparison bake looking at the different batters and the resultant cupcakes. 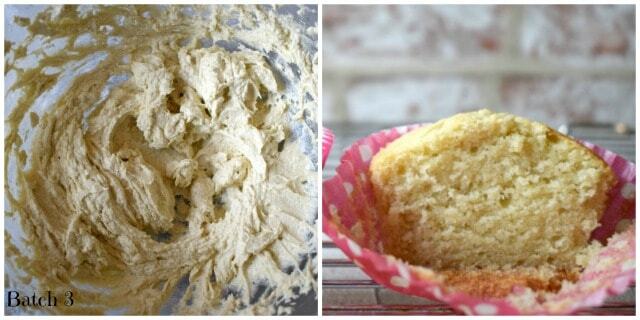 It’s been quite some time since I last shared a Side-by-Side Baking post, in fact it was way back on the 9th August. Metaphorically speaking there was certainly a thick layer of dust on them when I dug them out, think Miss Havisham of Great Expectations and you probably won’t be far wrong! As I mentioned in my end of year review post it’s a series I want to continue here on Only Crumbs Remain not least because it allows me to learn why certain techniques, for instance, are employed in baking. Now, I have two warnings about this post. Firstly this post is a little bit lengthy so you may want to grab a pot of tea or coffee before settling down to read! 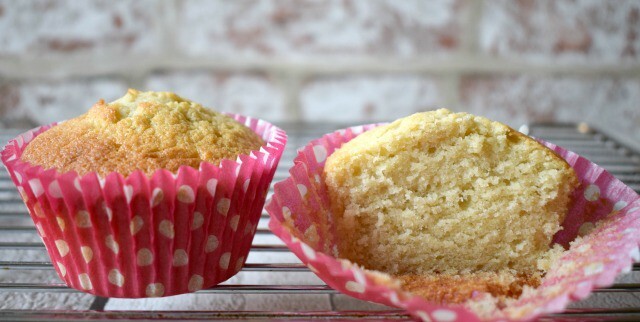 And, secondly, there is a little bit of science in this post (after all, baking in the school setting wasn’t once called ‘Domestic Science‘ for no reason!). I’ve aimed to keep the technical stuff to a minimum, especially as I’m not the greatest scientist (you should see my face when Mr E tries to explain the bending of timespace – and yes, those conversations do happen! ), and so I’ve linked into several internet articles should you want to read more detail from the author’s particular slant. About my Side by Side Baking Series. gently and what would happen to our cake if we don’t. This series is designed to experiment with and highlight such techniques and products with a view to appreciating why we carry out them out. So for instance, I’ve already looked at resting Yorkshire Pudding batters before baking, folding in flour by hand against that folded in with a spatula, butter quality in cake batters and the all-in-one method against the traditional creaming-in-method. These bakes are designed to focus upon one aspect of baking (or even ingredient) to see if we can make our bakes even better or even if there are some, dare I say, short cuts we can take to achieve a good result. Therefore, in this series there will always be at least two separate batches baked in these comparisons to allow me, and you as the reader, to literally compare them Side-by-Side. 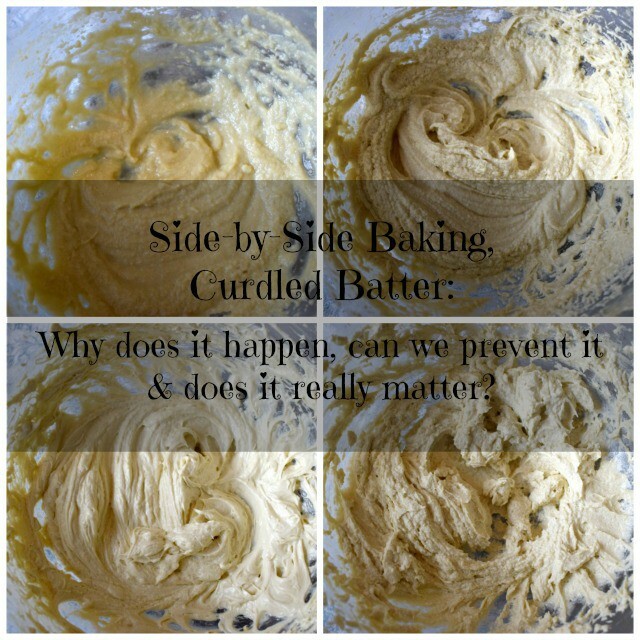 why a cake batter splits / curdles when eggs are added, can it be rectified, and to ask if it really matters or if it affects the final bake. The prompt for this baking comparison came from one of my recipe books, How Baking Works (and what to do when it doesn’t) by James Morton (I’m sure you recall him as the young Scottish GBBO constestant in series 3 who was training to be a doctor.) As the title implies, his book is far more than a recipe book. If you’re unfamiliar with it he goes through the step by step process of making chocolate brownies, macarons, biscuits and so on and explains why we carry out certain steps and even offers troubleshooting guidance if the bake fails. In his chapter for cakes he goes through the steps for the classic creaming method. He explains that the eggs need to be added to the creamed butter and sugar one at a time and went on to say that ‘curdling has been shown not to affect the final rise‘! When I read this I was somewhat surprised. 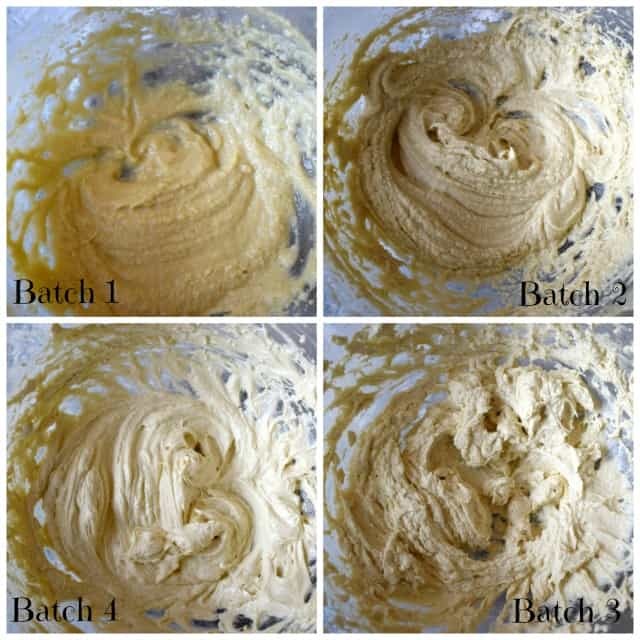 Not only because just about every cake recipe we read on line and in many tangible recipe books suggests adding a spoonful of flour with the last egg (in order to prevent, or remedy, any split / curdled batter) but also because the darling queen of baking herself, Mary Berry, has probably pulled a few faces at split batters on GBBO in the past! So, why does cake batter split / curdle when the eggs are added? Now, as a keen home baker I could make an educated guess as to why this happens though I couldn’t be completely sure (after all, this series allows me to learn some of the science behind baking alongside you). And so I carried out a search on the internet and read a few interesting articles, which I have linked to. Almost every article I came across explained that when making a cake batter we are creating an emulsion, so basically a liquid suspended in another. 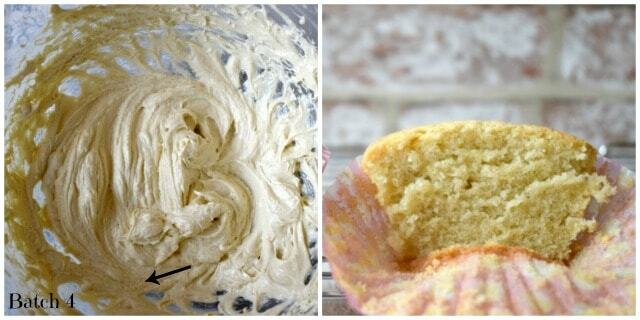 In a cake batter emulsion the water from the butter and egg white is suspended in the fat of the butter and egg yolk. The problem occurs when the emulsion becomes ‘fat in water’ rather than ‘water in fat’. But why does the ‘fat in water’ emulsion happen? John Whaite’s article in The Telegraph (another GBBO contestant) is very readable and explains that it’s all to do with the differing temperature of the ingredients. He says that due to the temperature differences between the eggs and the creamed butter and sugar it is difficult for the fats to blend with the water. 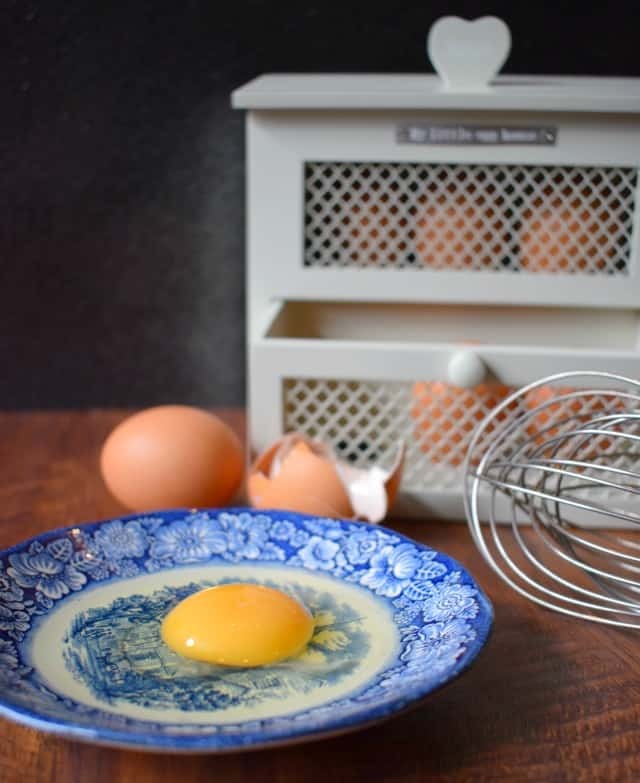 An article by Ask Peter says that butter sets at room temperature, so when the eggs are added it cools the mixture prompting the butter to set, making it look as though the mixture has curdled. So having all of the ingredients the same temperature helps create the emulsion, Serious Eats recommends having all of the ingredients around 21℃ / 70℉. So, how do we remedy a curdled / split batter? Well, during my reading every article has endorsed ensuring that the fat and sugar are beaten well until light and fluffy, scraping the mixture down from the sides of the bowl regularly, and then adding the eggs gradually (just as you would when making a mayonnaise emulsion!). Using Mainly Spoons elaborates on this further by explaining that a well beaten butter and sugar mixture will be able to hold more liquid (ie the eggs). Another common recommendations is to add a spoonful of your weighed flour into the batter when you notice it curlding and then continue beating, or even, as Nigel Slater states, with every addition of egg! However John Whaite’s article in The Telegraph (linked to above) doesn’t recommend this as he says it doesn’t resolve the issue, it simply ‘hides’ the curdle by thickening the batter and absorbing the liquid. He also suggests the beating of the flour with the egg will stimulate the gluten in the flour resulting in a denser sponge. 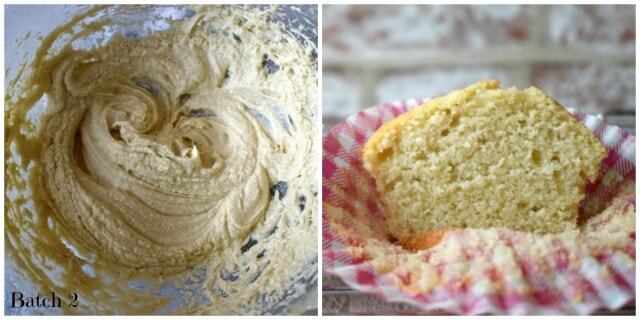 And as we found in our first Side-by-Side bake, a gluten free flour certainly makes for a lighter cake! John Waite, and one or two others, recommend we ignore the split batter as it will remedy itself in the oven anyway, and yet Asian on-line recipes suggests curdled batters hold less air and so won’t rise as much, they go onto suggest dipping the base of the bowl into warm water and then whisking to create a light consistency (sadly a tip I came across after I carried out my comparison bake). A contributor called Xinue in this forum suggests to warm the cracked lightly beaten eggs slightly over a double boiler (bain marie) as this is said to help with the emulsion process. And so, does it really matter if our cake batter splits / curdles? Well, this is the crux of the question really. 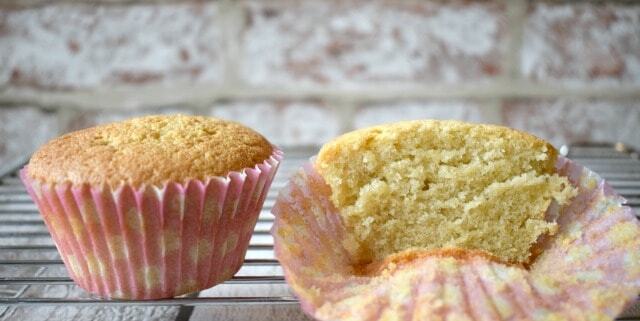 Does it remedy itself or does it impair the rise during the bake? I have to admit that ordinarily I don’t worry when my cake batter splits, as often happens, and simply continue with my recipe. I don’t even bother putting a spoonful of the weighed flour into the mixture. But could I be making better cakes and cupcakes by addressing the curdle, or even preventing it from happening in the first place? Batch 1: Allow the batter to curdle with eggs cold from the fridge (as it seems many home bakers seem to use them straight from the fridge). Cold milk was also used. Batch 2: Allow the batter to curdle with eggs at room temperature. Again cold milk was used. Batch 3: ‘Fix’ the curdle with flour, having used eggs at room temperature. Milk from the fridge. Batch 4: Use eggs heated gently until they are tepid over a double boiler (bain marie) and use milk at room temperature. How I went about the Side-by-Side baking comparison. saw a splash of milk added to create a ‘dropping consistency’. saw the muffin tin completely cool before being used for the next batch. Well to be honest I was quite surprised by the level of quality between the four batter emulsions. Not only was there clear visual differences in the state of the actual batters, but the cupcakes themselves seem to have fared differently during the actual bake. It really was something I wasn’t expecting giving that many bakers suggested that the curdled / split batter problem would sort itself out in the oven anyway! 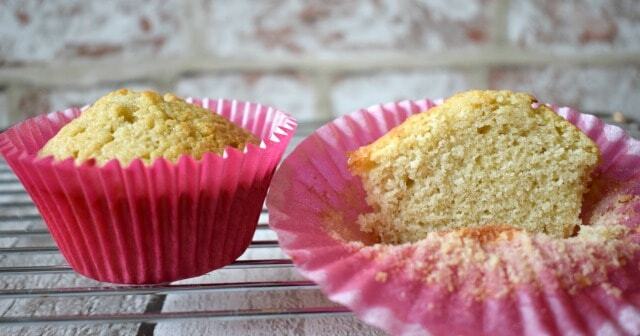 And the baked cupcakes identified….. The batters and the baked cupcakes. This batch was made with a cold egg straight from the fridge. It was undoubtedly the worst batter I have ever made. In fact I would ordinarily abandon that batter during a normal baking day! The emulsion was definitely very wet as the egg simply wasn’t blending with the creamed butter and sugar at all well. You may be able to see a pool of liquid (circled), this was in addition to the expected curdled / split appearance. 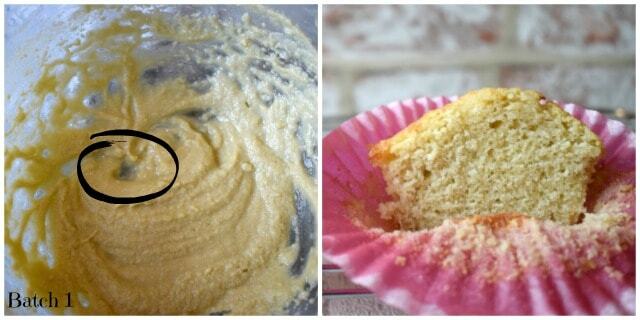 The batter was clearly showing the undesired ‘fat in water’ state. The baked cupcakes themselves did in fact rise, though the level of rise and the quality of the sponge itself was clearly affected. The bake is visibly fairly dense with a close crumb in comparison to the other three bakes. This batter saw the egg which had been stored at room temperature used and no attempt at resolving any curdling with flour was made. This is how I usually make my cake batters. As you can see from the image, the mixture certainly looked creamier than that of batch one with no pools of liquid, though it had clearly still curdled / split. 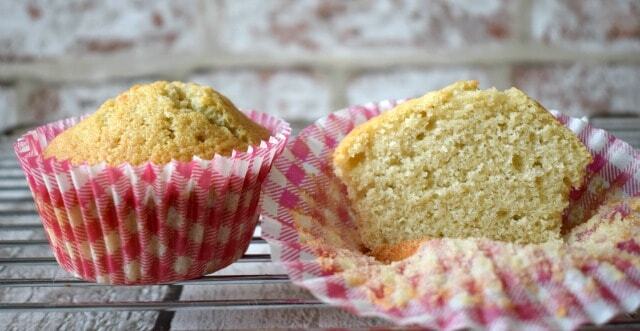 Once baked as a cupcake, the sponge had risen more than that of batch 1 and looked more inviting with a clearly more open structure. This mixture again used an egg at room temperature but a spoonful of the measured flour was added with the last addition of egg. The batter is again improved to that of batch 1 and 2, but if you look closely the mixture is still curdled. As for the cupcake itself it has clearly risen, but we felt that the rise was slightly less than that of batch 2, although the profile of the cupcake does look appealing. In this batch the egg was very gently warmed in a double boiler until it felt neither warm nor cold when tested with my finger. Clearly the aim wasn’t to actually cook the egg, but simply to warm it through. It was amazing how well the warmed egg combined with the butter and sugar to create a beautifully smooth emulsion. I must admit, though, that if you look very closely to the bottom side of the mixing bowl there is still some evidence of curdling, but it was far greatly reduced compared to the other batter mixtures. As for the resulting bake, well I think this certainly speaks for itself. It is by far the better cupcake across all four of the batches. It rose beautifully and, although I sliced into the cake whilst it was still a little warm, it definitely looks the most appealing. It was the most enjoyable to eat too. Comments about the curdled cake batter comparison bake. I must admit I was slightly disappointed with how batch two (the one with the room temperature egg and no flour added at the beating stage) fared. This is usually the method I adopt and usually (though not exclusively) it produces a better looking cupcake than it did in this bake. I we think we need to go back to how John Whaite and Ask Peter explained the reasoning for a batter curdling here. They basically put it down to the temperature of the ingredients, specifically that the eggs are too cold. Bearing in mind that we have had quite a cold snap here in the UK our eggs, even at room temperature, are still going to feel a little chilly. And that temperature difference would no doubt be highlighted more so when added to a creamed butter and sugar mixture which would have created a certain amount of heat during the 10 minutes of beating, even though only by a comparably small amount. But those differences can, and clearly do, have an effect. It’s also perhaps interesting to consider where we find our eggs in the supermarkets and local shops. They’re always on a shelf somewhere near the baking ingredients rather than being in a chiller cabinet alongside the creams and butters. As I mentioned in our recipe for Vegan Chocolate & Cherry Cupcakes, heat allows the proteins within an egg to unfurl, allowing the batter mixture of a cake to rise and ‘leaven’. Therefore it could be suggested that batch 4 was more successful as the unfurling had had a head start by the gently heating of the beaten egg. The other three batches would possibly have seen the cake batter set in the oven before the egg proteins had completely unravelled. I may well be wrong here, but it’s certainly room for thought! I know I shall certainly be warming the egg gently over a double boiler in the future, particularly when the weather is chilly! It is quite a long time since I wanted to thank you for that great post. Like a lot of people I knew that eggs needed to be used at room tenperature, but rarely thought of getting them out of the fridge beforehand. Your article being so convincing as to the importance of doing it, I did try right after to make my frangipane with eggs at room temperature for several hours, and the difference between that batter, and another one that I made just a few days before, was amazing. So, since then, I never missed to get my eggs out of the fridge a long time before, … until today. And I can now tell you that it seems to be working exactly the same way if using another fat than butter, like coconut oil for my recipe of this afternoon. I did make the same cake some weeks ago with eggs not cold, and today I could plainly see that my batter was not the same with eggs used directly from the fridge. A good reminder for next time. So thank you again for that great post, and for all your great blog as well. (P.S: sorry for my english and for the mistakes in my post). It's fascinating how something so basic, of having eggs at room temperature against those cold straight from the fridge, affects our bakes isn't it. I have to say that I've only ever used butter in my baking, but can just imagine how the same applies with other fats which easily solidify. You're welcome Mandy, though I hope it wasn't too long! I found it such a fascinating subject and the difference between the four bakes certainly seemed to warrent a certain amount of detail. I know what you mean about having the space (or not as the case may be) We have a fairly large kitchen and with that i think it means we end up with things all over the place! Thank you Eb. I have to admit that I wasn't expecting such a marked difference between batch 1 to batch 4, so I think there may well be a few of us heating the eggs gently when baking for a special occassion at least. I love your side-by-side posts, you're so thorough! Another really interesting read. The batches all look so different for such minor changes. Although I've never gone to the effort of gently heating eggs I do try to make sure all my ingredients are room temperature and I usually add a spoonful of flour with the final egg. My eggs are kept in a little egg house next to my stand mixer so I only need to remember to soften the butter. Aw thankyou Jo 🙂 They really do look vastly different don't they! I really wasn't expecting such a noticeable difference either. Our eggs also live in a little egg house too on our work surface, but even though they were at 'room temperature' they still felt cold to the touch once I'd cracked them open! 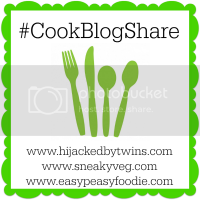 that is really interesting to see – when I buy eggs in the supermarket they are always in the fridge and I have always kept them in the fridge but my mum keeps them out of the fridge – I think I have never been keen enough on eggs and lately haven't been using them but now I am wondering about if it makes a difference with the the substitutes I use too! Ooh that's interesting, though I guess Melbourne is generally quite a bit warmer than we are here in the UK, specifically Yorkshire 🙂 Now that's a thought, I too am wondering if cake batters using vegan egg replacers are afffected by heat. Doesn't it just look the better batch! We don't keep our eggs in the fridge either, but with the chilly few days we've had they definietly felt cold to the touch. This is a great post! I always try & have my ingredients at room temperature, especially the eggs as I don't keep those in the fridge. However at this time of the year the temperature of the eggs is considerably colder than in the summer & I've got into the habit of adding flour with each egg – I might try the warming method next time to see how that goes, as the end result is definitely a neater bake! Thankyou Helen, it really does seem to make a noticeable difference doesn't it to have them at room toemperature atleast. We too keep our eggs on the kitchen work surface, but with this chilly weather they certainly don't feel as thought they're at room temperature! I'll definitely be gently warming our eggs before baking whilst it's still chilly! This is fascinating Angela! I'd never really thought about the temperature of the eggs I use before and I know I probably almost always use ones that are too cold. I will definitely start making an effort to warm them up a little in future or at least take them out of the fridge for longer before I use them. What a comprehensive and interesting test bake. Have to confess I often forget to take the eggs out of the fridge to come to room temperature when baking. Now I'm not sure if i would go to the trouble of warming them in a double boiler except for a special occasion (im far to lazy a cook) but perhaps I should at least let them come up to warm kitchen temp before using in future. Thankyou Jacqueline, I must say I think I'll only be warming the eggs when the weather is particularly chilly or as you say when making a special cake.